A group of researchers is in the process of developing a highly sensitive biosensor designed to detect toxic substances using bioluminescent inhibitory analysis as well as to monitor a biomarker for indicating stress and cancer, namely heat shock proteins 90 (Hsp90). The work is carried out at the School of Fundamental Biology and Biotechnology, Siberian Federal University, Krasnoyarsk, under the supervision of Dr. Rajeev Ranjan (India), postdoctoral researcher and senior researcher at the laboratory of bioluminescent biotechnology, and Dr. Valentina Kratasyuk, chair of biophysics (School of Fundamental Biology and Biotechnology SibFU) and leading researcher at the laboratory of bioluminescent biotechnology. “We study universal mechanisms of interaction between nanomaterials and biological objects of different levels of organization necessary for the development of biosensors in which the enhancement of the bioluminescent signal, and hence the sensitivity of the analysis, is achieved by integrating nanoparticles with bioluminescent probes, namely adenosine triphosphate (ATP) and flavin mononucleotide (FMN). ATP and FMN are the key substrates of luciferase of fireflies and luminous bacteria. 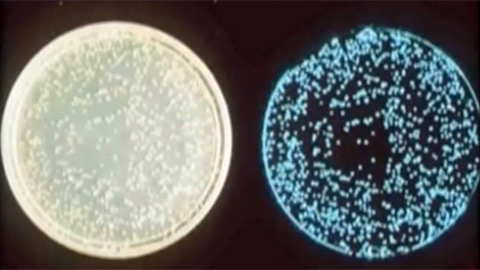 We have chosen these biological objects not accidentally since both bioluminescent systems are widely used in the development of bioluminescent biosensors, which allow obtaining a prompt and reliable analysis of the level of various substances. We have chosen gold nanoparticles (AuNP) to enhance bioluminescence and observed that signal amplification occurred during binding, for example, for ATP with AuNP up to 150 %,” — said Dr. Rajeev Ranjan. The enhanced luminescence properties of AuNP can be used to monitor the Hsp90 protein, an elevated level of which is traditionally considered to be a biomarker for indicating stress and cancer. “We developed a biological module to monitor the stress-induced protein on the basis of gold nanoparticles associated with adenosine triphosphate molecules. This type of protein has increased stability. When carrying out a luminescent reaction using the obtained biological module in the presence of Hsp90, a refolding (restoration of the structure) of luciferase occurs under certain temperature conditions, and the kinetics of the luminescent reaction changes, which allows measuring the amount of Hsp90, and thus detecting stress or diagnosing oncology diseases. We have confirmed that the developed biological module of the biosensor can be used, among other things, for the detection of heavy metals, as well as the control of stress overload in athletes. The researches in this direction are in progress. In the future, we plan to use the resulting nanoparticles for increasing the sensitivity of bioluminescent analysis methods,” — clarifies Dr. Kratasyuk. The project is supported by a grant from the Russian Foundation for Basic Research.